What Should Your Pace be on Weekday Runs? I will be running New York City as my first marathon and have a target finish time of 3:45. 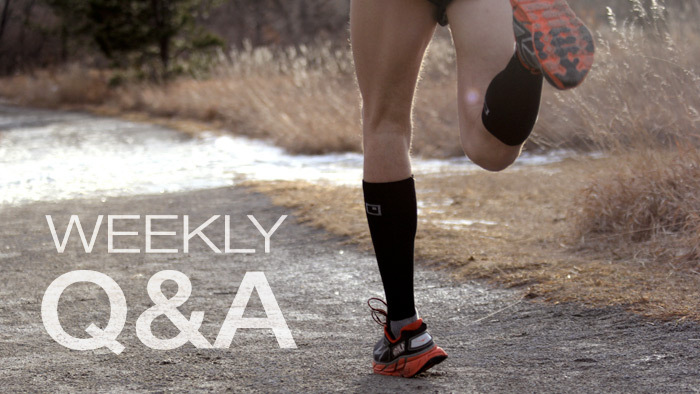 What training pace do you recommend during the 18-week Intermediate 1 program for weekday runs? For reference, my half marathon PR is 1:42; my 5-K PR is 21:15, and I have been participating in triathlons for five years. Good numbers, but I don’t like to prescribe specific paces for those easy, midweek runs, because conditions can change day to day, based sometimes on how hard you ran the day before and how hard you hope to run the day after. There is no speedwork in my intermediate marathon programs (only in my advanced programs), thus for most weekday runs, I suggest a “comfortable” pace, a “conversational” pace, allowing you to pick your own pace based on body signals without a coach looking over your shoulder. So unless the program prescribes race pace, let your body dictate how hard you run. Some days (for short runs) this could be faster than race pace and some days it might be slower than race pace. If the weather is hot (or cold) and the course is hilly, slowing down will allow you to finish more comfortably than if you tried to force yourself to match a pre-prescribed pace. On some other days when the weather is perfect and you have the wind at your back, plus you’re feeling great because yesterday was a rest day, let fly. Consider also that listening to body signals may allow you to vary your pace during the workout, starting slow and finishing fast, which is always better than the other way around. In most of my training plans, the most important workouts are on the weekend: a pace run on Saturday, a long run on Sunday for intermediate runners. You will benefit most from those key weekend workouts if you train intelligently the middle of the week, neither running too fast nor too slow. I know that may sound difficult as you begin your preparations for New York, but as you continue to train you should find this advice easier and easier to follow.